As directed by Ruggero Deodato (Jungle Holocaust, Dial: Help), Concorde Affaire ’79 manages to create a uniquely Italian take on the airport disaster genre by mixing low budget action (think lots of murky underwater diving scenes), bad special effects (do you think Britain or France was going to let Deodato within a country mile of a real Concorde? ), a generous helping of slumming movie stars (Van Johnson and Joseph Cotten? An awesome team – in 1945! ), and a story that not only fails to make sense, but whose climax involves a very suspenseful phone call. James Franciscus, used to supplementing his TV work with classic Italian fare (The Cat of Nine Tails, The Last Shark, Killer Fish), has no problems dragging us along for the ride though. As reporter Moses Brody, he desperately needs a story to get him back to the front page. Though it’s really only alluded to, there was apparently a problem with one of his stories about a politician’s scandal that he couldn’t get proof of. A mysterious call from his ex-wife (not to mention the opportunity to escape his whining and maybe pregnant girlfriend) get him down to the Antilles at almost supersonic speed! And what an awesome vacation it turns out to be! His ex is dead before he gets there, he gets beat up by some thugs and ultimately is befriended by one of his ex’s sailing pals! At the center of all this drama is the unexplained crash of a Concorde. A competing aircraft company led by Cotten is behind the sabotage. Their goal is to scare people from flying on the Concorde and thus ensure that South American companies do not order the new jet. The problem is that a stewardess survived the crash and is now being held by some people down in the Antilles. They’re blackmailing Cotten’s company and asking for payment of one million dollars to dispose of her. What I could never quite grasp is how anyone connected Cotten’s company to the aircraft’s crash. This thing is lying on the bottom of the ocean and the stewardess doesn’t know how the sabotage was carried out let alone who was behind it. Even stupider is everyone’s efforts killing off Brody. Sure, he’s the nosy reporter who’s going to cause trouble, but how is he ever going to get Cotten? Just because a plane crashes, doesn’t mean a specific business competitor was responsible. But who cares about common sense and coherent storytelling when there’s a car chase to be had! And another jet to crash! And a captured stewardess to rescue! After initially being misled by her captors that the stewardess trying to escape them was actually just an epileptic girl having a fit, Brody realizes the truth once he sees a newspaper with her picture in it. Unfortunately for his sailing pal, this is after he got shot to death while diving with Brody to explore the wrecked Concorde that they miraculously found on the ocean floor. Brody rescues stewardess Jean the only way he knows how – he invades the boat by himself, conks a dude on the head, and swims away with her. But not until after he overhears the important plot point that Cotten is planning to down another Concorde! The race is on to save all the passengers, with Brody and Jean being pursued through the countryside by the thugs intent on stopping them! What follows is a series of edge-of-your-seat phone calls! 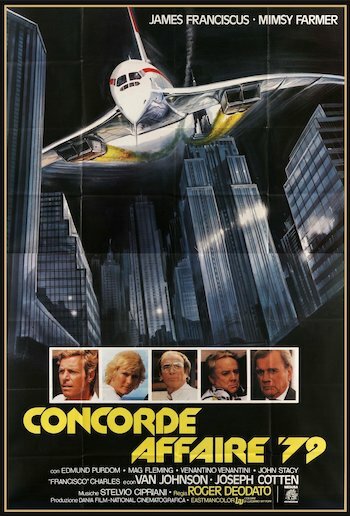 First, a couple to the disbelieving American consulate, then once at the consulate, a call to the flight control tower trying to save the stricken Concorde! What would be an anticlimactic scene for any other actor, Franciscus manages to make his own, despite having no real role to play in the movie at this point. The stewardess has to describe what happened on her flight to give the engineers enough information to figure out how to save the second Concorde. But she’s just too dang hysterical to remember it all! Enter Franciscus and one of the great pep talks in all of airplane disaster movie history! He tells her that the people on that plane are depending on her! No pressure there! But he brings it home by urging her to try to give the information needed and saying, “what the hell, you only live once!” Well, heck yeah! Let’s save that frigging plane now! You know, since I only live once and all! The movie’s ending, in keeping with its beginning and middle, doesn’t make much in the way of sense either. Cotten reads a headline in the paper that says something like “Journalist Saves Concorde” (see, that pep talk was even better then we imagined!) and announces that he wants to hire Brody to be their journalist! And Brody telephones a pal in New York to advise him that he’s coming back to push Humpty Dumpty off the wall! And the stewardess goes back to Paris by herself! And through it all, Brody never gets on a Concorde! Like his work in Beneath the Planet of the Apes, Franciscus proves again he is a more than capable stand in for Charlton Heston in this spiritual successor to Heston’s Airport 1975. And Deodato proves yet again that bad models, cheesy sets, and third world location shooting are a more than capable stand in for an intelligible plot.